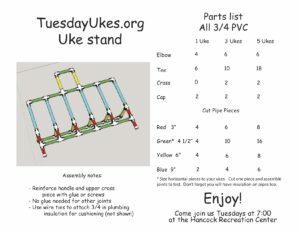 Marty designed and built a great, lightweight ukulele stand that we’re using for our loaner ukes. 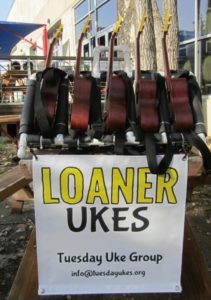 You can build it for 1, 3, or 5 ukuleles – enough for everyone! Our loaner concert ukes in Marty’s Magic Uke stand. Click here to download a copy of the plans for yourself.